The City of Wells is going to visit KWVR for their 50th gala. 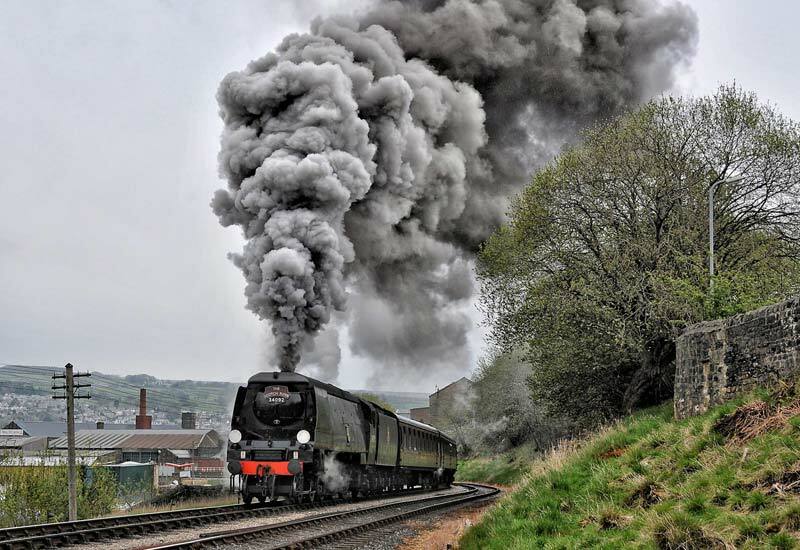 KWVR own the City of Wells but she is based at the East Lancs Railway. The East Lancs have fundraise money to buy the City of Wells. This will be the last time that KWVR will have the City of Wells in their ownership. What other locomotives will be at the 50th gala? The KWVR have booked Royal Scot 4600 , GWR Pannier Tank 7714 and more! 34092 was constructed at Brighton Works in 1949 and later that year it was named Wells which was changed to City of Wells in 1950. It was initially allocated to Stewarts Lane where it worked out of Victoria to the Kent coast. After the electrification of the Kent lines the locomotive was moved to Salisbury in May 1961 from where it operated over the main line between Exeter and Waterloo. In its late service it was attached to 4,500 gallon tender rather than the initial 5,500 gallon tender which it was originally fitted with. The replacement tender had previously been attached to 34051 Winston Churchill. In November 1964 it was withdrawn from service and sent to Woodham Brothers at Barry for scrap where it arrived in March 1965. It remained there until October 1971 when a group from the Keighley and Worth Valley Railway (KWVR) bought it. It was moved by road to Ingrow. Following restoration work it entered service on the KWVR in 1979. In service it ran on the main line as well as being a regular performer on the KWVR. Because of the problems with insufficient lifting of the exhaust smoke by this class of locomotive British Railways had fitted 34064 Fighter Command with a Giesl ejector chimney in 1962 on the grounds that a desired spark arrestor would suffocate an ordinary blastpipe. The ejector improved smoke deflection and fuel consumption, allowing it to steam well with low-grade coal. In 1986 the owners of City of Wells had a similar fitment made which resulted in the locomotive having improved fuel economy, better lifting of the exhaust and more power output. In 1989 City of Wells was taken out of service for overhaul following its boiler certificate expiring which took 25 years to complete to enable it to steam again in 2014.